Watching UK TV outside of the country can be difficult enough without throwing in the internet restrictions of China on top. While most UK TV services offer online streaming platforms, unfortunately in nearly all cases they’re blocked when you travel outside the country. It doesn’t matter if you’re going to China or anywhere else, you’ll find them blocked regardless. China, as you are probably already aware has some very strict internet regulations. This means the majority of UK TV sites are pretty much blocked in China including the likes of BBC iPlayer. To bypass these blocks you’ll need to use a VPN app. However, there are two huge considerations for China. Not all VPN apps work in China and secondly, not all work with UK TV services. Below I’ll be discovering which do work allowing you to watch UK TV in China with minimal fuss. If you’re already in China or you’ve been there before then you’ll already be aware of the huge internet restrictions in place. You’ll probably already have toyed with VPN services in the past too to access blocked sites like Facebook and Twitter and apps such as WhatsApp. To watch UK TV in China you’ll need not only a VPN app that works there but one that works with the majority of UK TV online streaming services. After numerous tests on the ground, ExpressVPN is about the best service you can choose. They work with most UK TV services and they work in China. 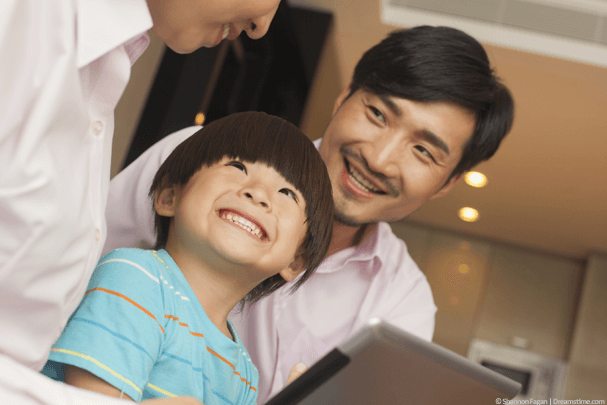 Now you know which VPN services work best in China for watching UK TV it’s time to sign up for one and download their app. This is a very simple process and even if you haven’t used a VPN app before you’ll find this takes just a few minutes. Sign up for one of the VPN services above, for example, ExpressVPN. Their 12-month package is nearly 50% cheaper than paying monthly. Then download their app from the ‘Products’ section of their website. If using an Android / iOS device it’s best to download before you travel to China if possible. Open the app and login with your account details. Press ‘Choose Location‘ (1) and then press ‘United Kingdom‘ (2). You may need to press ‘Connect‘ (3) depending on the type of device you’re using. Wait a few seconds for the app to connect. Once it’s connected visit your favourite online streaming service, for example, BBC iPlayer. Watch UK TV in China with ExpressVPN. 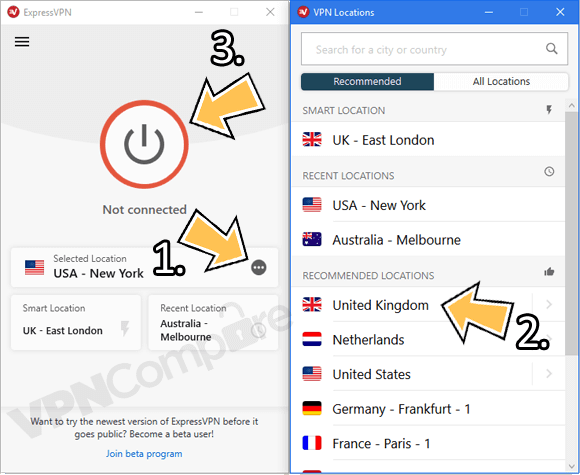 Now you’re connected to the VPN app from ExpressVPN or one of the other providers you can access almost all of the UK’s online streaming services. These can be watched either by visiting their websites directly or by using their apps. Although you may find it more difficult to download their apps when outside the UK. Exclusive Offer: Save 49% off today! Any UK TV service that has an online TV streaming site or app can be watched in China when using a VPN. You can also access most subscription services if you’ve got a valid subscription such as Sky Go or BT Sport. Unfortunately, Virgin TV doesn’t work anywhere outside the UK even when using a VPN app. Chinese authorities want to control the flow of information on the internet throughout the country. They carry out a campaign of blocking websites. They’re well aware that visitors and residents use VPN apps to circumvent such blocks and so actively work to block VPN access. Many VPN websites are blocked to make it difficult for you to sign up so it’s important you sign up before visiting China for the most hassle-free experience. Even VPN apps that do work can be hit and miss with low speeds and other issues such as periods of downtime. There is really no way around this and being able to access UK TV in China should be considered a luxury and not something that is guaranteed even when using VPN apps. To watch UK TV in China you’ll need a VPN app. As the Chinese government want to control the flow of information in the country, many VPN apps are blocked. One that’s tested working is ExpressVPN but there are others such as VPN.ac and NordVPN. You should sign up for ExpressVPN and download their app. If possible do this before travelling to China because it will make it a much easier process. Then connect to the United Kingdom. Once connected you can enjoy watching British TV in China.